There are a few things to keep in mind when planting beets. You need to make sure to put them in a spot that gets plenty of sun. And since they are a root vegetable, you also need to work the soil deeply enough so that the roots are able to easily penetrate the soil. In addition, beets are a cool season crop that doesn't do well in hot weather, so pay attention to planting times. 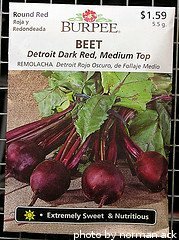 Beet seeds germinate when soil temps are 55-75 degrees F. Their ideal weather is daytime high temps of 60-65 degrees F. They are usually planted a few weeks before the last expected frost in the spring. Since they grow fairly fast, the idea is to get them planted and harvested before the hot weather of summer sets. Beets are also a great choice for a fall crop. The first frost seems to make them even sweeter. 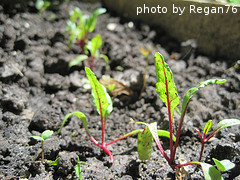 To havest them in the fall, you'll need to start planting beets in the summer. In most cases, plant them 10-12 weeks before the first expected frost in your area. This will give them time to germinate and get established before the colder weather hits. If you are growing beets to produce good-sized roots, the soil needs to be worked to a depth of at least 8", and generally speaking, the deeper the better. We find that hilling up the soil is an easy way to get it deeply worked. First, we go over the area a few times with a tiller, breaking up the soil at least a few inches deep. The we just use a shovel and make raised rows about 6-8 inches tall and 6 inches across for the length of the row. Just scoop up dirt on the outside edge of the row and pile it in the middle. If you are planting multiple rows, leave enough space to walk between them - 12 inches is usually the minimum, but 16-18" is much better if you have the space. Those extra few inches make weeding and harvesting a lot easier. After the raised row is made, use a hoe or shovel to create a small furrow in the middle of the row. It should be about 1/2 inch deep. Scatter the beet seeds into the row, trying to space them as evenly as possible. We try and stretch the seed and space them about every 2 inches or so. You can certainly sow the seed a bit thicker, but it will mean more thinning later on. After the seeds are in the furrow, cover them up with a 1/2" layer of fine soil. If your soil is dense, you can cover them with potting soil or top soil, which will make it easier for them to push through after germination. After the seeds have germinated, thin the plants so they are spaced 2-4 inches apart, depending on the variety of beet you are growing and how big you want the root to be. Really large sugar beets can be 8 inches across or more, so allow more space between plants for those. Smaller varieties that are grown mainly for their tops can be spaced a little closer. Now that you're done planting beets, it's time to think about watering them.